The Columbia River Sting is a heavy-duty fixed-blade tactical knife designed by knifemaker A.G. Russell. 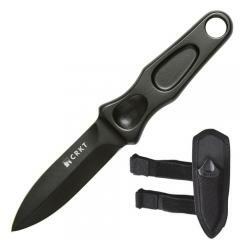 It features an extremely sturdy carbon steel spear point blade, with a double edge for enhanced penetrating power. Its plain edges also slice efficiently for additional versatility. Its black powder coat reduces wear and corrosion while also preventing reflections that might give away your position. The handle is also made from forged steel, and features ergonomic contours and thumb detents to provide a secure grip. A lanyard hole at the end allows you to lash it to your wrist or wear it around your neck. If you prefer to carry it on your belt or boot, the included nylon sheath features a sturdy attachment clip, as well as a glass-reinforced nylon insert for shape retention.